A year ago, I blew the motor in my 1974 Volkswagen while trying to make it from Sacramento to New York City. I made it as far as Arkansas, where my car has sat ever since. Now, finally, I am flying down to retrieve it and finish the cross-country journey I started. 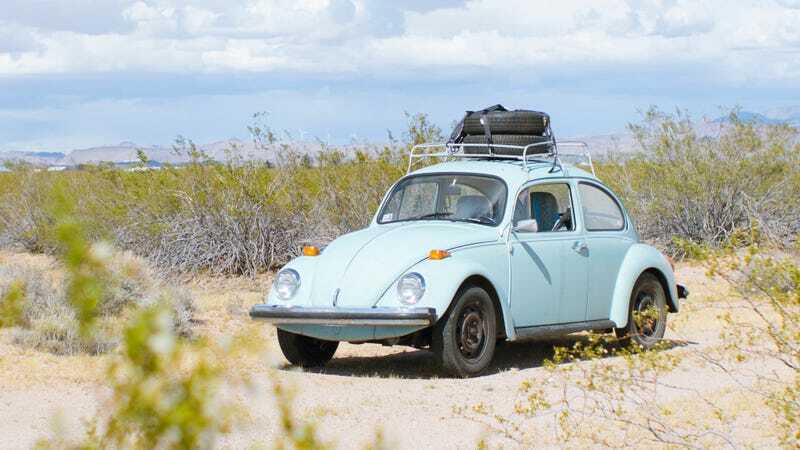 The last car I owned was a 1973 Volkswagen Baja Bug. It was my dream car. I rolled it. I got it fixed. I drove it until it started to shoot fire out of the exhaust, then I drove it some more. After a while, though, I realized that it was a money pit. I don’t exactly remember when that moment was. Maybe it was the time I tried to untangle its nest of burnt wiring in the middle of winter, maybe it was the time it started making a banging noise on the highway that was a piece of the rusted-out floorboard flapping in the wind. Either way, I figured that even if I dedicated myself to repairing every terrible decades-old problem on my Baja, it would only make it as good as it already way. It was never going to get better. I tallied up a list of parts it would have cost me thousands to get the car even in a reasonably sustainable position. With that kind of money, I figured, I could just fly to California and buy a rust-free old VW and drive it back. Any money past that would make the car better, something the Baja was never going to be. I happened to be flying out to the West Coast anyway, so I set my flights to leave me in Sacramento. I opened up Craigslist the moment I hit the ground and two days later I owned a new car. It was the same color blue as my Baja was (before my Baja got painted primer gray by some grungy past owner) and it was parked under a beautiful live oak tree. It was a shining beacon of my childhood in NorCal. I handed $2,500 to its owners, Star and Crawdad, who asked me to tow it the 12 miles to my buddy’s house. I quickly found out it needed an engine-out repair and I need to be back in New York City in ten day’s time. What followed was a frantic wrenching and road-tripping escapade, living like a bum, burning my hands hot-swapping spark plugs, crossing the Sierra Nevadas on most of a motor, getting lost in the desert with fumes in the gas tank, making it through Texas under cover of night, cheap motels in unincorporated towns, constant swings between despair and joy, culminating in a clunk in the middle of the night on I-40, a few hundred yards from the Tennesse border. A tow truck scooped me up as 18-wheelers ran past, carrying me back to Little Rock where the tow truck driver and I only by chance happened to drive past the one specialty old Volkswagen shop in town: O’Hara Automotive. I slept outside O’Hara that warm spring night, and by morning one of their mechanics and I figured the car had dropped a valve and its engine was toast. This didn’t bother me too much. I’d planned on putting in a new engine anyway: a 1776cc hot rodder special. A 1776 was never offered by the factory, but is the simplest and most reliable bigger-displacement setup you can make out of a basic Beetle engine. Plus, it’s the most patriotic displacement in the car world. I had a day to get back to New York, so I told O’Hara to swap my bad engine for a new 1776 from the big VW parts distributor Mid America while I hopped on a plane for home. These engines only take a few weeks to build, so I wouldn’t be waiting too long before I’d get back to my Beetle. But weeks turned into months, and months turned into a full year of waiting. My name was put on a list. Engines got built before mine. Parts were backlogged. Someone at the shop got sick. Phone calls from Mid America saying they figured it would only be a few weeks until the engine was good, oh no there has been a delay, another delay, another delay again. I had no leverage. Taking my money back and going to a different engine builder would only result in a worse engine that would take just as long to build. In the interim, I still could at least drive my old Baja. I did some wild road trips in it, which were fun as the rusted-through exhaust made the thing barf fire from cylinder number one. I knew that the hole in the exhaust was going to burn out the valves in the engine, and that the exhaust was rusted to the block, and that was a repair I did not want to attempt. If it went bad, I’d be drilling a rusty bolt out of my engine block. That is not something I was keen on giving a shot, so I put the car on Craigslist and sold it to a young auto tech in training. He said he wanted a project car. I told him he found the perfect one. The brakes started to grab a week before I sold the car. I had been grabbing a hold of the brake pedal and pulling it back with the top of my foot. On the kid’s test drive, he told me I should rig up a piece of string to the pedal to help pull it back. He had devised a hooptie fix for the car that even I hadn’t thought of within minutes of getting behind the wheel. I knew he was going to be fine. I watched as he motored out into the distance. I let my mind wander to the new ‘74, lost out in Little Rock. Only a few weeks ago did I get the call from O’Hara that my engine had made it. Mid America finally shipped the completed thing from their little engine-building shop in California and it ran like a dream. After all those months, it only took O’Hara a few days to get the engine in with all-new wiring and a new oil pressure gauge. A few days on and now I’m going to fly back down to Little Rock to finish the journey I started last spring—to pick up the car and finally bring it back to New York.